Be careful where you point that thing! 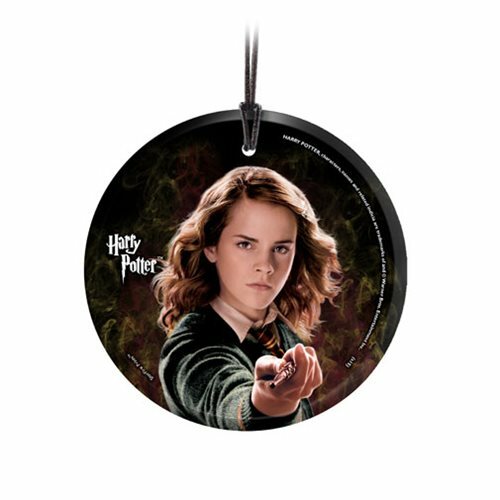 Hermione Granger points her wand and looks ready to cast a perfect spell in front of a dark background that swirls with magic in this 3 1/2-inch diameter Harry Potter Hermione StarFire Prints Hanging Glass Ornament. It brings the magic of the movies into your home and lets every guest know that you're a fan. Translucent yet vibrant with color, the light-catching properties of the glass ornament illuminate the image and make for a perfect Christmas tree ornament or year-round décor, and it comes with a hanging string for easy display. Or give it to your favorite wizard-in-training!